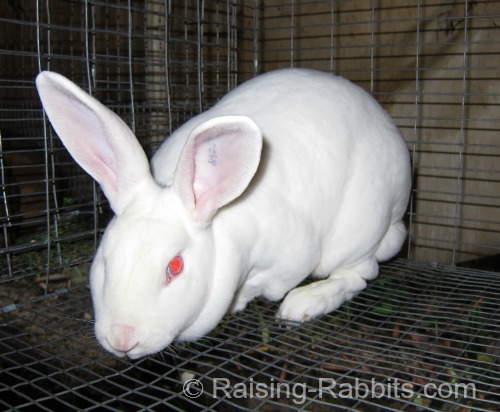 Rabbits as Pets: What are rabbits like? Is pet rabbit care complicated? Will a pet rabbit enhance your life? 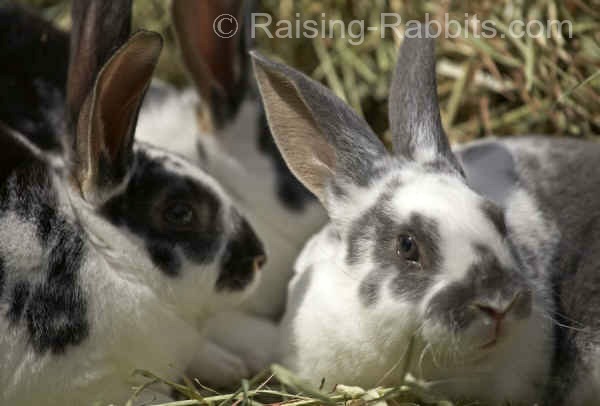 Let us tell you a little about rabbits, and then you can decide for yourself if you’d like to keep pet rabbits. Rabbits are quiet and frequently gentle. Rabbits don’t bark. They don’t climb trees. They don’t rip the drapes to shreds. They don't crow at 5 a.m.
A rabbit must be very confident in its surroundings before he relaxes. As a prey animal, it is aware that every toothed creature sees long-eared rabbits as meals. Rabbits are nervous; they will hide ‘n peak until they recognize that you are friend, not foe. That’s a $64 dollar word meaning active at dawn and dusk. They sleep all day in their burrows. As the sun sets and the temperatures cool, out they come and begin feeding. They frequently spend several hours browsing on the surrounding bushes and grasses, and then rest for a few more hours, before their early morning browse, just before their bedtime. This means rabbits as pets are wonderful for working people and school kids. As you go off to work or school, the rabbit "hits the hay," so to speak. When you come home from the office, your pet rabbit is just waking up and raring to go. You can enjoy each other for a few hours, and then put it back into its space (whatever that looks like) until the next evening. Rabbits as pets are usually friendly. Most of the ‘wild’ is out of domestic rabbits, but not entirely. 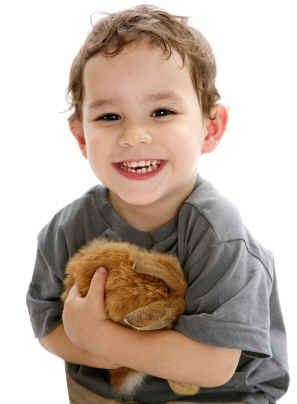 Dogs, cats, and barnyard animals have been domesticated literally for millennia; not so rabbits. People have kept rabbits as pets for just a few hundred years at most. Some rabbits as pets, especially young does (females), get hormonal as they hit ‘puberty.’ They get cranky, and all they want is to breed and have babies. This is something they can outgrow, thankfully. Once they are fully adult, chances are they’ll level out and be just fine. Rabbits like to chew stuff. Rabbits are herbivores. They eat grasses, bushes and bark. And, since they don’t see in color (I’m told), there’s a LOT of stuff in your house that they can confuse with proper food - your furniture, your phone lines, your electrical cords, your carpet, and more. It just comes with the territory. Those that keep rabbits as pets inside their home have to find ways to ‘rabbit-proof’ the house. Cords can be hidden within cord protectors or plastic tubing slit down the side. Furniture legs can be wrapped. The rabbit can be housed on vinyl tile, or supervised closely until he learns the carpet really doesn’t taste all that good. Rabbits can live in your home or a back yard hutch. If you really like the idea of having house rabbits, there are ways to keep rabbits as pets in the home. But don't feel compelled! People have kept their rabbits in back yard hutches for 200 years. There is no need to pursue alternatives unless you really feel like it. In the heat of the day, wild rabbits are safely underground, where the temperature is much cooler than above ground. Above approximately 85 degrees Fahrenheit, the rabbit starts to pant and get stressed. A few days of this could put a rabbit into heat stroke and death. If yours are outside rabbits and you just have a few of them, the dog days of summer would be a great time to bring pet rabbits inside the cool house, hutch and all, if possible. 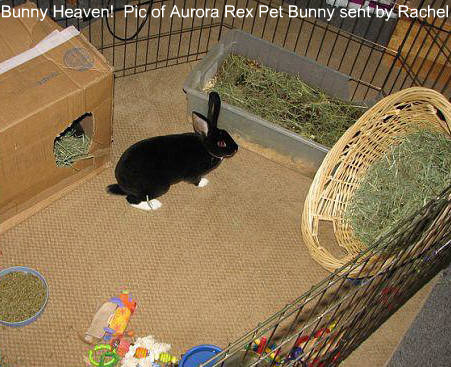 See Cooling Rabbits for other ideas on how to keep pet rabbits cool during summer. Rabbits as pets are actually very easy to keep and to care for. Just fill the rabbit’s basic needs - food, water, shelter, a clean environment, and protection from predators. See Pet Rabbits. If it’s your pet rabbit, no doubt you also want to enjoy the friendship and companionship of the rabbit, when you’re not hanging out with your human friends. That’s when you’ll take it out of the cage, play with it, give it space to safely roam, like a rabbit run, and stuff like that. There’s more than one way to take care of a rabbit, there really is. As long as your rabbit is healthy, cared-for and well-attended, you can feel confident you’re doing a good job with your rabbits as pets. Rabbits are cute and cuddly -- but the greater reality is that the rabbit’s sole purpose on earth is to feed other carnivores and omnivores. Yes, humans included. In the big scheme, pet status is a rare privilege for a few rabbits. This being true, rabbits don’t have any basic ‘right to life,’ other than what you personally give to the pet rabbits you choose to keep. See Animal Rights, and/or Animal Ethics. As much as you might feel sad at the idea of rabbits as prey, there's just no way to get around this fact of nature. It’s okay to be okay with this. Rabbit Raising Problem Solver covers a huge gamut of questions and answers pertaining to rabbits as pets.